Does the thought of driving a van leave you feeling unnerved? Vans, especially windowless cargo vans, typically have a lot of blind spots that make it difficult to see what is in your driving path when you are in reverse. 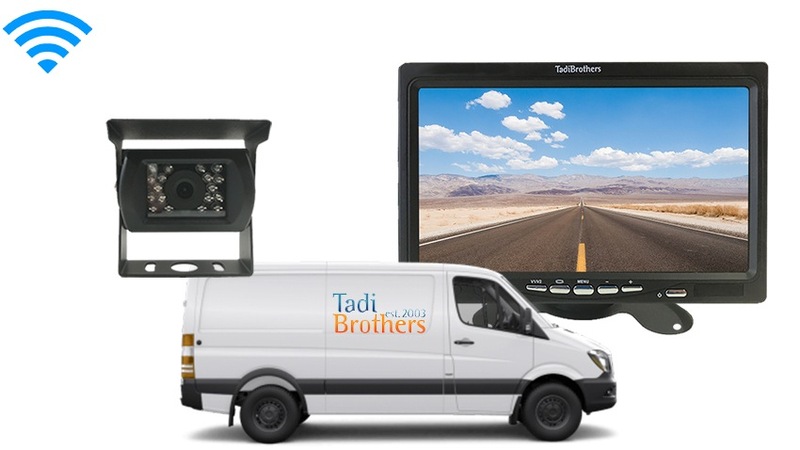 The Sprinter Van Backup Camera System (7" Monitor and a 120° CCD Mounted RV Backup Camera ) from Tadi Brothers is the perfect solution for your van driving woes. Even the best driver can benefit from the added coverage of a backup system for Sprinter vans. Included with the Sprinter Van Backup Camera System (7" Monitor and a 120° CCD Mounted RV Backup Camera ) is a monitor so thin and lightweight that you won’t have to worry about it taking up a great amount of room in your van. Two video inputs allow you to connect cameras, a DVD player, or even a gaming console. The monitor connects to any power source - even a cigarette lighter. For this system created particularly for cargo vans and delivery vans, we have included our highest quality RV box camera, which results in delivering the most lucid images directly to your 7” monitor. Paired with a wide viewable angle, high definition technology creates an astounding resolution. The included 35-foot cable fits virtually any Sprinter van and you always have the option to go wireless by purchasing one of our convenient battery packs. Installation is so simple that many choose to add additional side cameras to their Sprinter vans for even greater coverage of their surroundings. Installation of this Sprinter backup system is simple and quick. Drive your Sprinter van with care today with a camera system from Tadi Brothers. This item includes a 35 Foot cable, if its going on an RV, BUS or any other vehicle longer than average SUV we recommend upgrading to our premium extension cables located on the top left of the page. 30 Days 100% money back guarantee. We know our products are world class and we stand by them 100%. We even have a 24/7 tech team ready forany questions you have. Buy with confidence the TadiBrothers team won’t let you down.